Get hands-on farm experience with the animals. Milk a cow, bottle feed a calf, venture inside the chicken coop, and interact with other farm animals. Recommended for all ages. In addition to the Farmer's Apprentice tour, enjoy the sweet taste of homemade ice cream - an authentic farm-to-table option. Create a batch of ice cream, set the machine, and sample homemade ice cream with your choice of toppings. In addition to the Farmer's Apprentice tour, learn the fundamentals of artisan cheesemaking. Transform milk into curds and whey, learn about the ingredients, and become equipped to try it at home. Recommended for adults and children 10+. 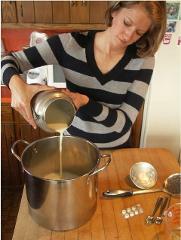 In addition to the Apprentice tour, learn how to make soap from goat milk, lye, and oils. See each step of the process together with an instructor, and become equipped to try it at home. Recommended for adults and children older than 10. Join an abbreviated, guided farm tour. 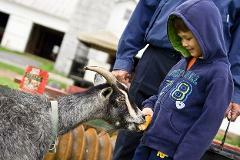 Visit the cows, interact with small animals, and learn about a working farm. Enjoy the sweet taste of the homemade ice cream - an authentic farm-to-table option. Create a batch of ice cream, set the machine, and sample homemade ice cream with your choice of toppings. Recommended for all ages. 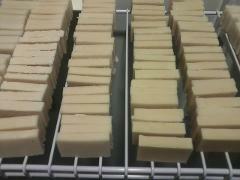 Learn how to make soap from goat milk, lye, and oils. See each step of the process together with an instructor, and become equipped to try it in your home. Recommended for adults and children older than 10.